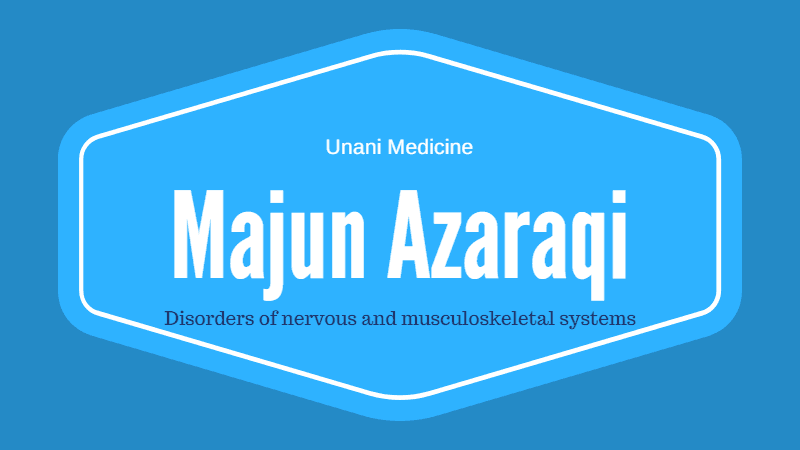 Majun Azaraqi is a Unani Medicine used for diseases related to nervous and musculoskeletal systems. It provides relief from arthralgia, gout, sciatica, paralysis, facial palsy, tremors, and epilepsy. It is also used for treating syphilis. It has analgesic, anti-inflammatory, nervine stimulant, cardiac stimulant, and aphrodisiac actions. It improves urinary bladder tonicity and provides strength to the urinary bladders. So, it can also be used for enuresis (bed-wetting), urinary incontinence, and other problems related to atonic or neurogenic bladder. Prepare Safoof: Take all herbs and kernels. Make powder of all ingredients of Majun Azarqi. Mix the powder in the quantity described in above table. Make Qiwam (concentrated syrup): Now, take honey and make a solution with a thick consistency (concentrated syrup). Mixing Safoof & Qiwam: Remove Qiwam (concentrated syrup) from the heat and add Safoof (powder mixture) gradually and continue stirring to mix it properly. Now, Majun Azaraqi is ready for preservation. Preservation: Preserve Majun Azaraqi in a glass jar. Majun Azaraqi has following medicinal properties. The general dosage of Majun Azaraqi is as follows. Majun Azaraqi is likely safe for most individuals in recommended dosage when taken under professional supervision. There are no side effects observed with Majun Azaraqi. Majun Azaraqi contains detoxified poison nuts (Strychnos Nux-Vomica), which makes it unsuitable for pregnant women and lactating mothers.